We had another great lunch at the hotel before our tuk tuk to the hot air balloon came to pick us up. We only got a few hundred meters from the hotel before the driver got a phone call from Lucky, telling him that they had technical problems with the balloon and that it would be out of service for at least one week. We turned around and went back to the hotel. Bummer! At 7 PM we walked to the city center, and tried to buy a local SIM-card on the way. But the owner was not able to get it to work, even with help from all the other shops around him, so we ended up getting our money back. 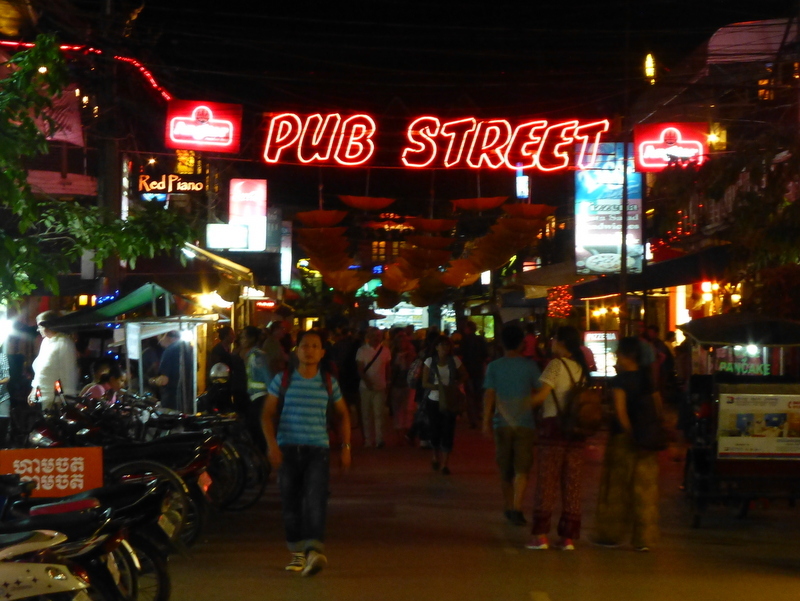 When we got to the city center we walked through the night marked (too touristy for us) before we got to the pub street, a street mainly for tourists with several restaurants and of course plenty of pubs (as the name suggests). We sat down on one resturant and had a beer berfore we finally found a SIM card that worked at a nearby shop. We had dinner at Khmer Family Restaurant, where they had great food and our favourite Cambodian lager (Angkor) on tap for only 0,5 USD. The tuk tuk driver home wanted 5 USD, but when we said we would walk home instead he agreed on 2. We had a few beers at the hotel bar, sharing travel stories with a retired American living in Equador. After a couple of roundes of pool, we were ready for bed before midnight (long day!). For our last full day in Siem Riep, the main plan was to relax and really enjoy being on vacation. 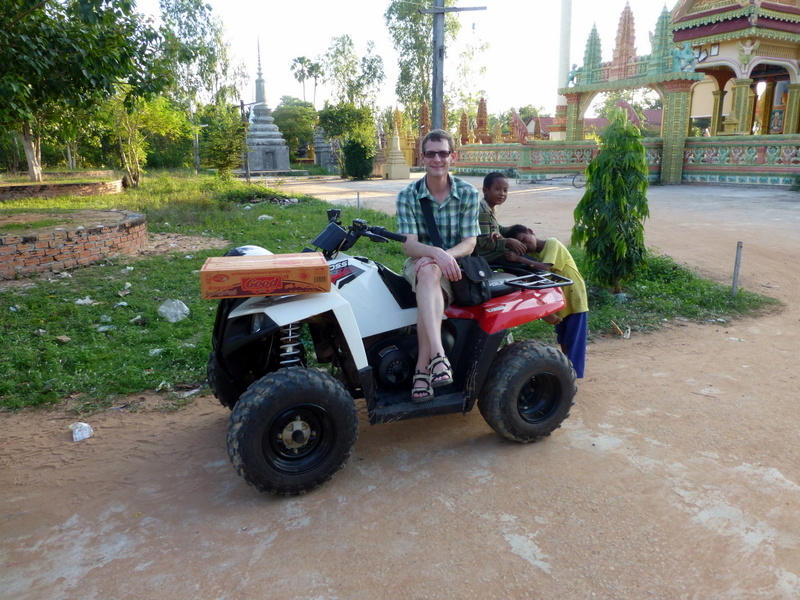 We had a slow morning, relaxing in the garden and reading our books in the hammock, but soon agreed that we had to find some activity, and we booked a 2 hour quad bike trip. We where picked up at 3.30 PM, and went to their garage for a quick training and a short test ride around the block. We both got a hang of it very quickly and went off into the country side with our guide. We met several groups coming back and they were all around 10 people, so we were probably very lucky to have a guide to ourselves. In the beginning there were a little bit of traffic to pay attention to, but we soon got to the country side where we mainly drove on small dirt roads between the rice fields and past small farms. It was quite bumpy, but after a very short while that was just fun! Driving slow was actually the most difficult part. Kids along the road were waving at us, and with some of them we did “high five’s” while driving by. We stopped at a large monastery in a small village. The old temple was very small, but a new one had been built only 2 years ago. We saw several young kids in orange robes, and our guide told us that for poor families sending their sons to the monestary was the best solution. Fredrik’s bike had a problem with the gear, so a guy from the garage came with a new bike for him. 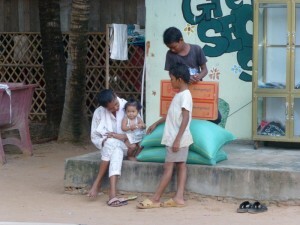 Since our next stop was an orphanage, we decided to spend the waiting time to buy some food to give them. The guide suggested a box of noodles, but we ended up buying that and 50 kg of rice as well. At the orphanage a young boy showed us around. It was started by one family and not backed by any organization, but they had several class rooms, big bed rooms and a large area to play on. They all went to public school, but had language classes at the orphanage as well, and his English was excellent, so they obviously had great teachers. Several of the buildings were donated by tourists who had been there to visit. We also bought some lollipops while waiting for the new quad bike. The plan was to hand these out to the kids we drove past, but becuase of the gear problem, we were a bit late to see the sunset at the best spot. Our guide said that he had several spots which was good, but since we were more than willing to drive fast he aimed for the best spot. After driving like crazy, having to brake very hard at a few occations (dogs, oxes etc.) 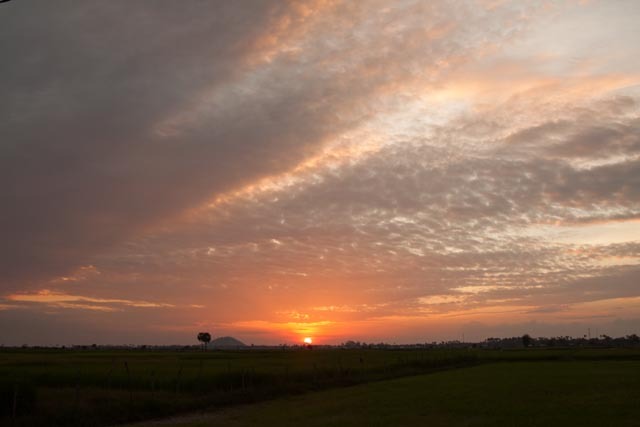 we maid it just in time for the sunset over the green rice fields. Beautiful!!! We turned on the headlights, and started our drive back to the city via even smaller dirt roads. Now we had plenty of time to stop, so all kids we drove past got a lollipop, and they were all jumping with joy. Fun! Back at the garage we washed of most of the dust and got in a tuk tuk back to the hotel. We jumped off at the mini mart 200 meters from the hotel, and bought some “fancy” local beer (stouts and dark lager), because we planned to take a shower and go to bed early. But we stopped at the bar for one beer, and started talking to a couple from Brisbane, Australia. We had so much fun that we ended up opening and sharing the beer we bought, and suddenly it was dinner time. We stayed at the bar all evening, but both managed to sneak in a quick shower in between the beers and conversations. A guy from New Zealand had bought some Cambodian whisky that he shared with us. It was actually quite good (but only 23%), and of course we had to go get our Norwegian aquavit to share with him and Mr. Lucky. Great night again, but as usual we got to bed a bit later than planned.